characterized by its stylized decorative enrichments; sharp-edged, linear appearance; and vertical emphasis on six sets of bay windows. The Century is a full-service luxury condominium with three attended entrances, expansive lobby, and invitingly landscaped terrace. Its large, gracious apartments with prewar detailing, many featuring a sunken living room, make it a wonderful place to unwind with family and friends. The neighborhood is a cultural mecca. You’ll be a short five-minute walk from Lincoln Center, New York’s world-renowned center for the performing arts and home to the Metropolitan Opera; the New York Philharmonic; and other performing arts groups and museums. And you’ll be surrounded by highly-rated restaurants and upscale shopping opportunities, including the nearby Time Warner Center. Finally, you’re just five minutes away from Columbus Circle’s numerous public transportation options, including the A, C, B, D, and 1 trains, as well as many buses. 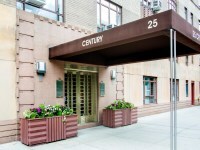 The Century’s condominium status makes it an excellent investment for international buyers seeking a NYC pied-à-terre, as well as for native New Yorkers. Join owners such as Jeff Bezos, CEO of Amazon, in making The Century your home.